Powerful PPT to PDF software that converts Microsoft PowerPoint 2003/ 2007/2010 (.ppt/.pptx) files to Adobe PDF files, and preserves the original text, tables, image and layout in original files, and your documents will run perfectly on different computer. ver 2.1 add support .pptx file.Customize authority to copy content, edit content, or print the PDF file.Set password for your PDF files with 40 or 128 bit encryption. Add Title, Subject, Author, Keywords and creator information in PDF. Set password for your PDF files with 40 or 128 bit encryption. Customize authority to copy content, edit content, or print the PDF file. Add a watermark on your PDF, in order to protect confidential and private files. Qweas is providing links to AXPDF PowerPoint to PDF Converter 2.1 as a courtesy, and makes no representations regarding AXPDF PowerPoint to PDF Converter or any other applications or any information related thereto. Any questions, complaints or claims regarding this application AXPDF PowerPoint to PDF Converter 2.1 must be directed to the appropriate software vendor. 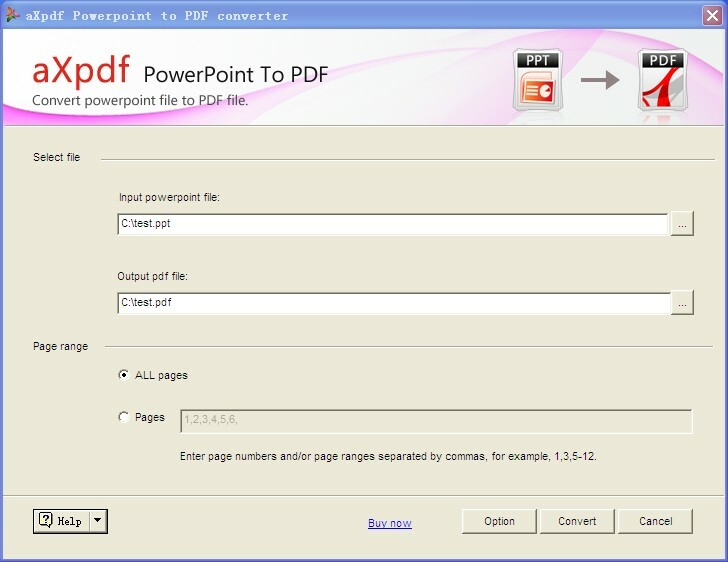 You may click the publisher link of AXPDF PowerPoint to PDF Converter on the top of this page to get more details about the vendor.